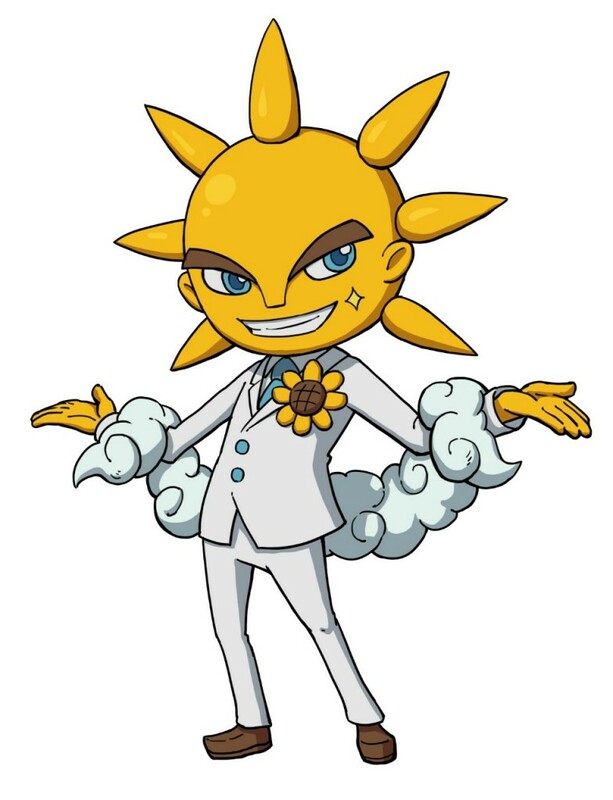 Hareotoko literally meaning "Sunny Man"
Haretoko brings sunshine with him, no matter the forecast. Besides being a counterpart to Ame-onna, Hareotoko could be based on the hiyori-bō ("fine weather monk"), a youkai from the Ibaraki prefecture that lives in the mountains and whose appearance heralds sunny weather. His likeness became the basis for the good weather charms called teruterubōzu. He and Ame-onna share a similar relationship with Dismarelda and Happierre, as a gloomy female colored mainly in cool coloring is paired with a sunny-dispositioned male that mainly is colored in warm colors, and have opposing effects on the environment, with Hareotoko/Ame-onna being the weather and Happierre/Dismarelda being emotional. Interestingly, both Happierre and Hareotoko both belong in the Heartful tribe, and their names both start with "h"-starting kana.